Started by The Boom in 1953. Completed by students from San Lorenzo Valley High School over a period of many years. Tuning and updating by William Visscher. with direct electric valves for the antiphonal divisions. And Hear This... Your browser does not support the audio tag. Granduca... Your browser does not support the audio tag. 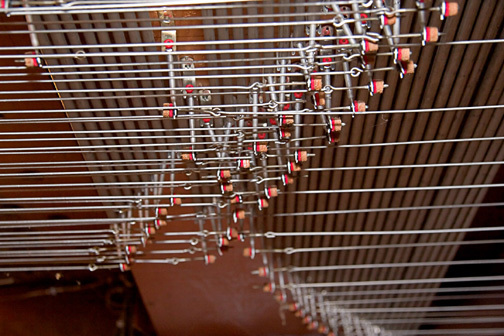 This is a Baroque-style tracker action organ containing 40 ranks of pipes numbering about 2500. The wind pressure is 60mm of water in a manometer. The Trackers Underneath the Main Windchests operate the valves. The Squares change the direction of the Trackers from the Console to the Windchests above. The Backfalls pull the stop sliders into action. The Rollerboards of the Hinterwerke division. Roller Boards for the Hinterwerke division direct the action from the keyboard to the windchest. The Console. Notice the wooden stickers behind that push the key action to the squares above. 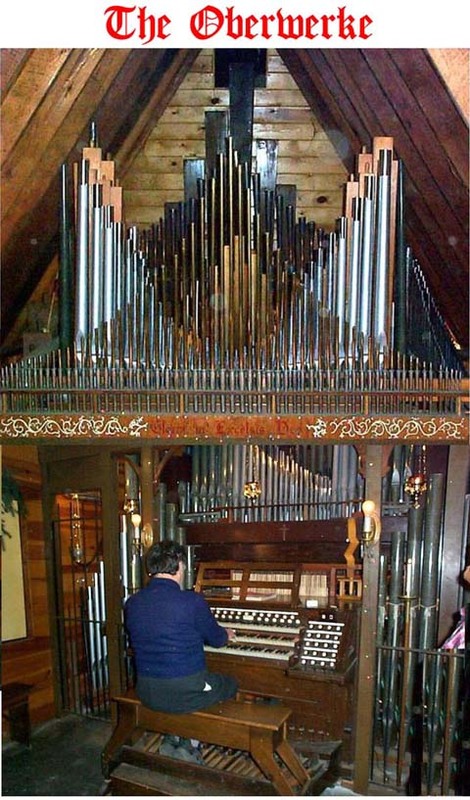 In 1953, Trinity Parish Church (now Cathedral) in San Jose, replaced the console of their organ, vintage 1879, which had been donated by The Boom's great grandmother. 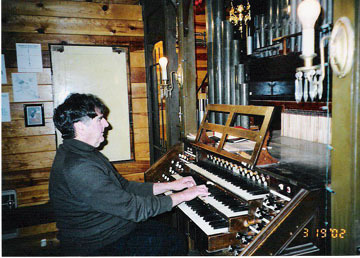 The young Boom rescued the console and two sets of pipes which were replaced in the organ, and started a project that just about got him thrown out of his home. 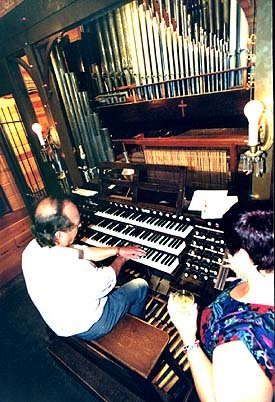 Bill Reid, long-time organ builder from Santa Clara, inspired The Boom to keep at it over the years. 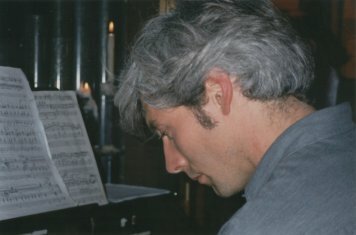 Bill gave much advice, organ parts, and experience towards the project. 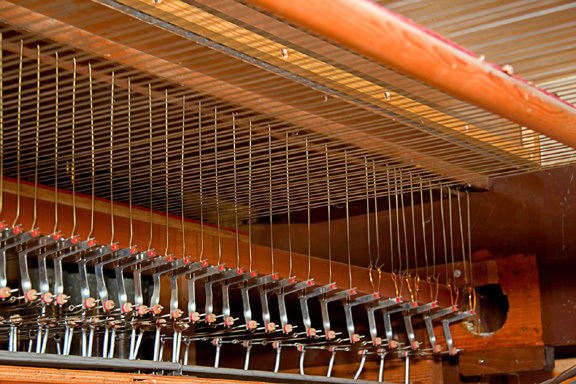 Since then generations of Boom's students have helped with the building of this massive instrument. They have done thousands of hours of work on all those intricate mechanisms that you will see as you explore it. Each of those things represents many cuss words! 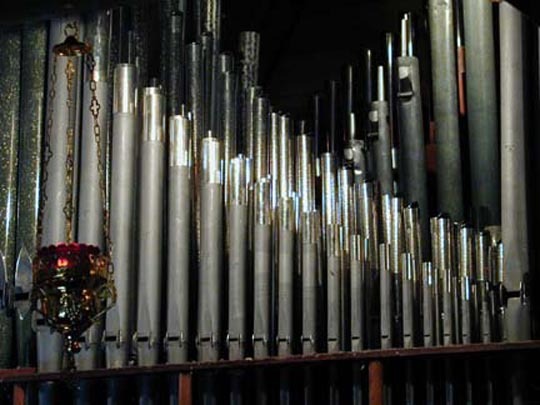 John West, a venerable organ builder of great esteem, has revoiced the pipes to give them the authentic sound of the Renaissance and the Baroque periods. 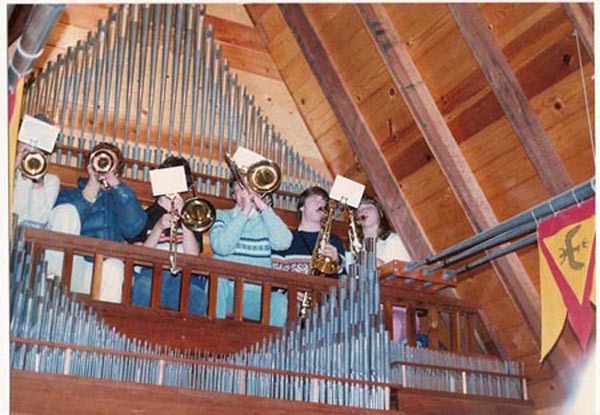 Bill Visscher maintains the tuning for concerts and plays for the Christmas Carols. December, 2000, Visscher Associates added the 16' Dulziaan to the Great Division. Whereas the Regal is Musick to Confess by, the Dulziaan is Absolution Denied. Here is the Great Division with the Dulziaan third rank from the left, and the Regal third rank from the right. Most of the rest is a magnificent Principal Chorus with 3 rank mixture (which is out of sight). 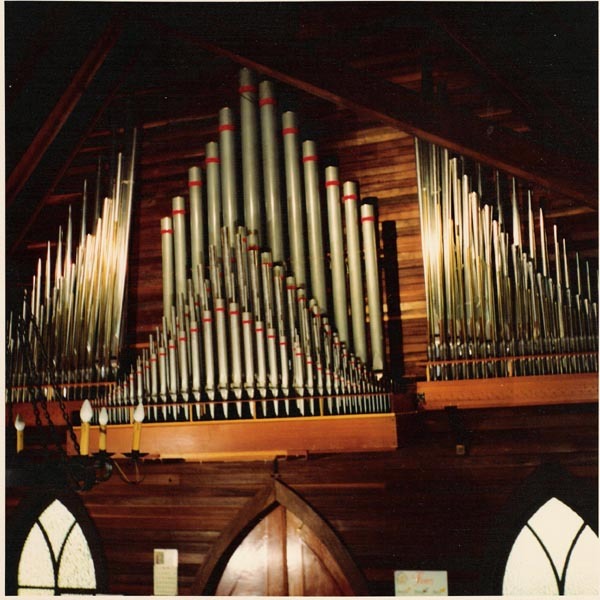 Click here for: More on the pipe organ, its history, how it works, its physics. Many thanks to Bill Visscher for playing the examples and John Haskey for recording them! 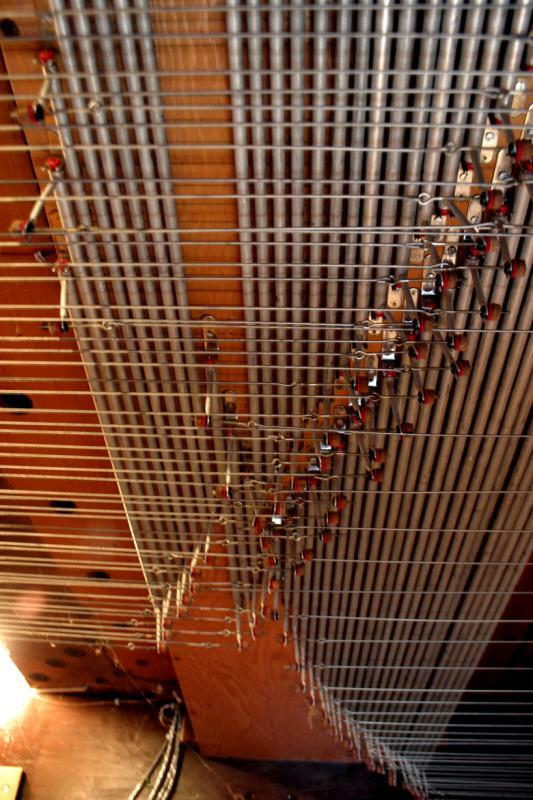 DIVISIONS OF THE ORGAN: Gallery, Keyboards, Upperwork & Zimbelstern. PROCESSIONALS: The Bishop, Royal Fanfare, Rigaudon. GREAT CHORALES: Helmsley, In Dir Ist Freude, Psalm 42. DIFFERENT RANKS: Principals, Reeds, Flutes, Gemshorns. VARIOUS RANKS: Full with Mixtures, Great Variations, Various Reed Stops. Click here for Charles Rus' Awesome performance of The Tuba Tune by Lang played in concert at Boomeria August 18, 2001. 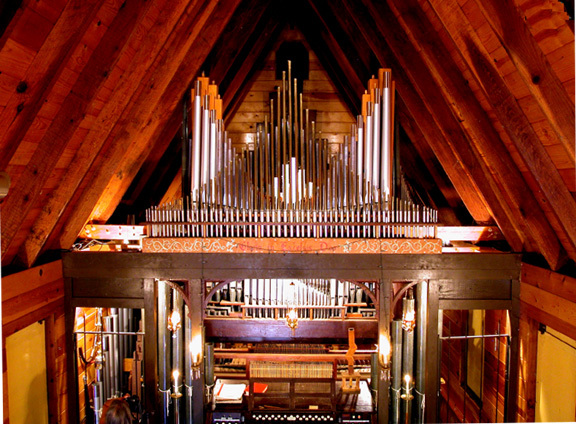 And we built the pipe organ at St. Andrew's Parish Church, Ben Lomond, CA. It has seven ranks. 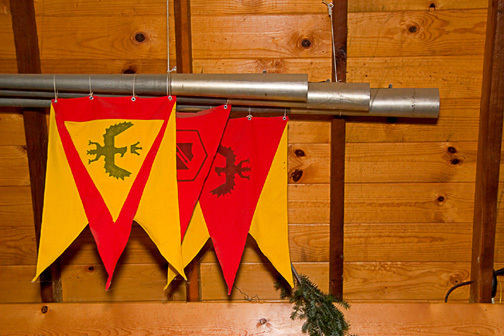 Original three rank design (in 1958) by Bill Reid, expanded to seven ranks by The Boom and his students in 1973. 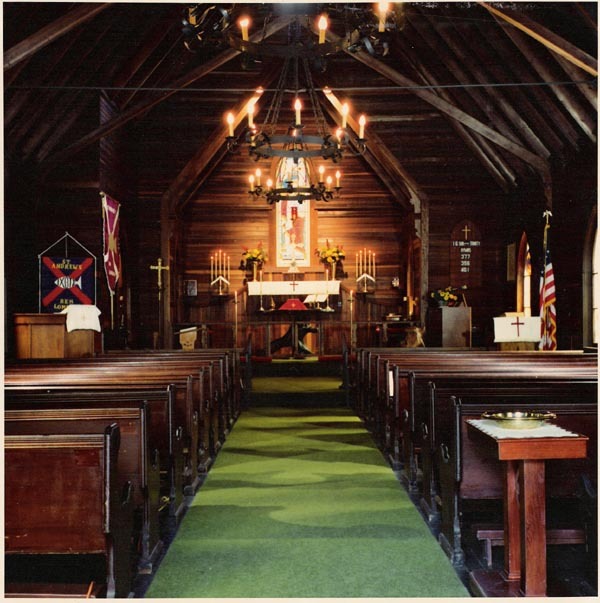 By placing the pipes on the back wall, no church space was sacrificed. Notice that the console, to the left of the American flag, is very compact. 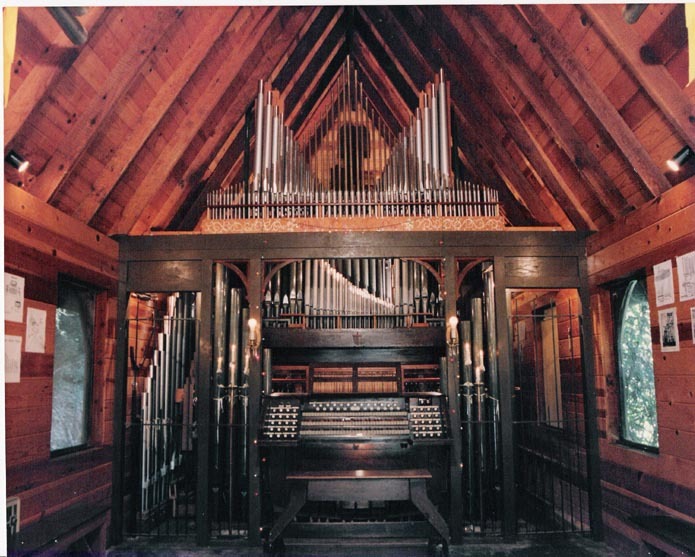 A pipe organ need not take up a large amount of valuable space. Two Manual Console with Pedals, Direct Electric Action, unified to 32 stops! Baroque voicing, wind pressure 60 mm of water. 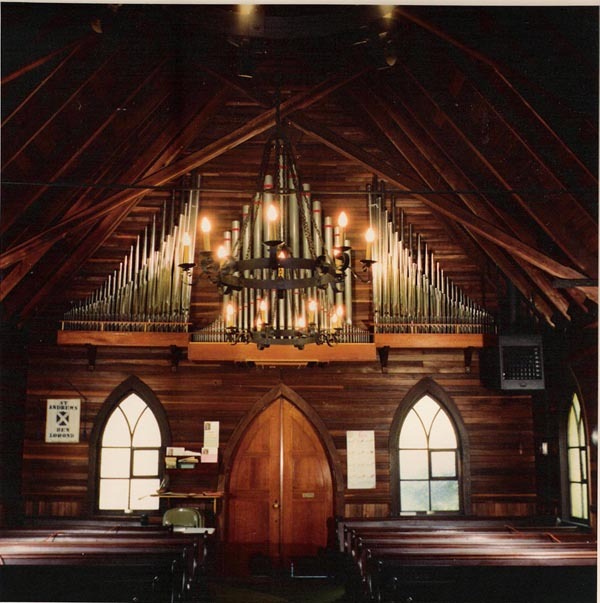 On February 3, 2006, St. Andrews hosted a concert for Five Organists and Oboe. It was well attended with a very enthusiastic audience. The Musicians were: Nicki Kerns, Bruce Sawhill, Tanyia Rekow, Anne Elizabeth Thiermann, Colin Whitby-Strevens, Vlada Volkova-Moran, Tanyia Rekow, Oboe. Recording thanks to John Haskey. Noels by Daquin Played by Anne Elizabeth Thiermann. Am Sonntag by Brahms Played by Nicki Kerns. Freu' dich Sehr, O meine Seele by Guggenheim Played by Vlada Volkova-Moran. Prelude by Albinoni Played by Vlada Volkova-Moran with Tanyia Rekow, Oboe. Allegro by Albinoni Played by Vlada Volkova-Moran with Tanyia Rekow, Oboe. Ich ruf zu Dir, Jesu Christ by Bach Played by Bruce Sawhill. Four Seasons: Winter by Vivaldi Played by Anne Elizabeth Thiermann. Romance, Eine Kleine Nachtmusik by Mozart Played by Colin Whitby-Strevens and Nicki Kerns. 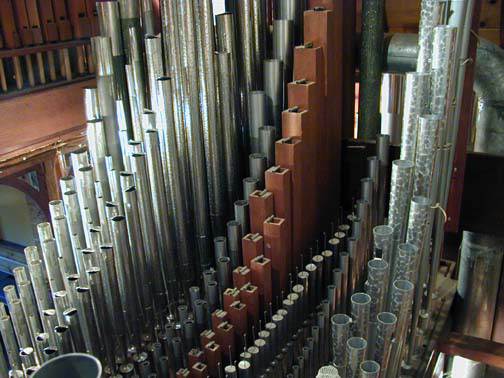 Click here for more on the pipe organ, its history, how it works, its physics. 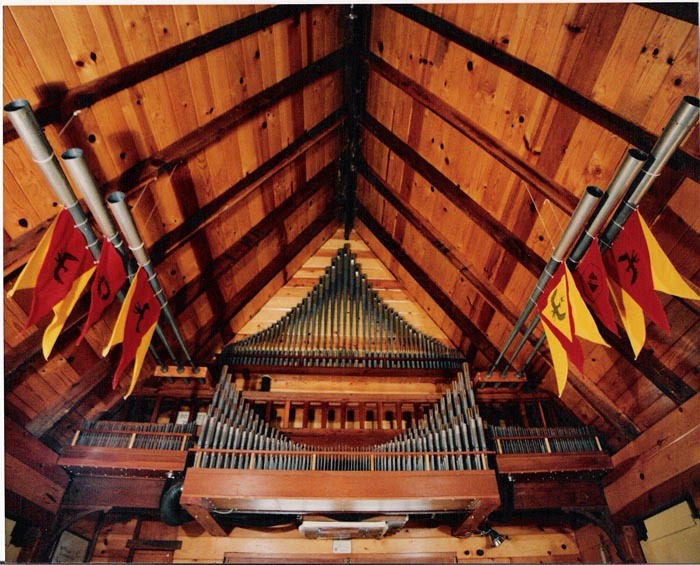 .......... Santa Cruz Sentinel on the Pipe Organ. Keyboard musicians are welcome to come play the organs at Boomeria. 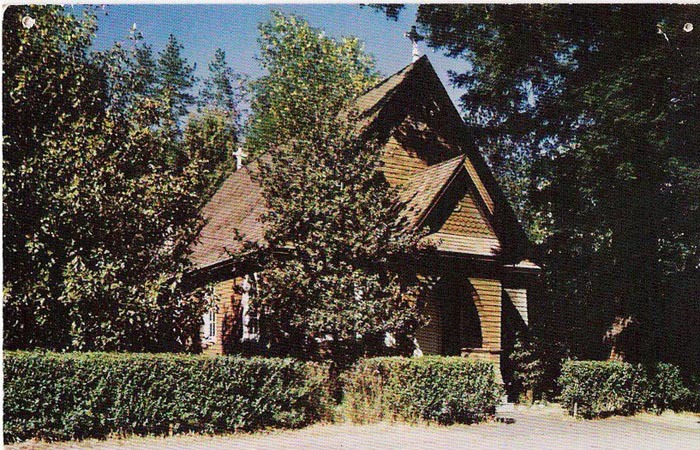 We are located in the mountains of Santa Cruz county in California.